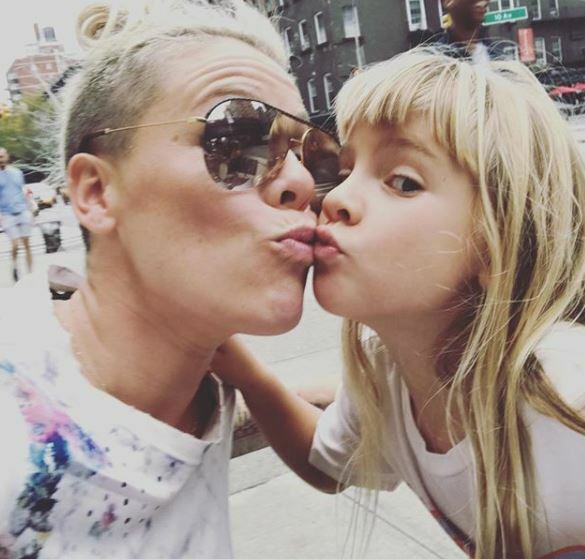 Pink has revealed the reasons why she’s made the decision to raise her daughter as gender neutral. The singer said she wants to allow six-year-old Willow to ‘make free choices’ not dictated by what society suggests women should or shouldn’t do. Pink, who also has an 11-month-old son, Jameson, with husband Carey Hart, recalled a very cute, recent conversation with Willow. And she’s like, ‘sure mama, and we are going to live with you while our house is getting ready’. The bathroom outside the kindergarten said: ‘Gender Neutral – anybody’, and it was a drawing of many different shapes. I took a picture of it and I wrote: ‘Progress’. I thought that was awesome. I love that kids are having this conversation. This isn’t the first time Pink has spoken publicly about freeing future generations from gender conformity, take her heartfelt speech at the VMAs, which she dedicated to Willow. During the speech, Pink spoke of her fight to teach her Willow the lesson of self-acceptance after the youngster made some worrying comments about being ‘ugly’. Pink said Willow thought of herself as the ‘ugliest girl’ she knew, because she looked like ‘a boy with long hair’. So what did the singer do? She made her daughter a Powerpoint presentation, filled with images of famous ‘androgynous’ icons, from Prince to David Bowie, Annie Lennox to Janis Joplin. I’m much more mum than I am anything else. Absolutely 100 per cent. They (Willow and Jameson) are my everything. It’s the two best decisions I ever made. Every decision I make is a choice because it affects my family. I do bake sales and lemonade stands. I take my kid to school and try to get there on time. I’m a f**king grown up now, it’s so weird. I’m still a 12-year-old boy. Pink, who’s making a musical comeback since the birth of her son, gained worldwide praise when she posted a photo of her breastfeeding with the caption: ‘Jameson can multitask too’. In the snap Pink is having her hair and make-up done as she gets ready for a photoshoot while breastfeeding six-month-old Jameson who wants to get involved too, grabbing a make-up brush. Fans immediately rushed to the comments to praise the superstar who has always supported public breastfeeding, a topic that is often argued about. One fan called Pink ‘a great example for mums’ while another commented ‘you are the proof that one woman can be a star, a mother, a wife, a lover, a friend, an incredible human being’.